Set a hard maximum: Take a good look at your financial situation and savings to determine how much you and your fiance can afford to put towards your wedding. If possible, talk to your respective parents to know what they would be willing to pay for. Add this to your budget to get your absolute maximum. List all known expenses: Create a spreadsheet and tally up all the expected expenses you can think of. For fixed costs such as venue, DJ or band, officiant and outdoor furniture, source a range of price quotes in your area or directly ask the person or company you would like to use. Make educated estimates for other expenses like food, drinks, and transportation. Estimate the number of people you expect to grace your wedding and how much the average person can consume. Create a buffer for last minute or unknown expenses such as additional outdoor furniture, staff tips and so on. The sum of all these figures should be your budget goal. If they exceed your maximum, you may need to re-evaluate your priorities. The sooner you start saving for your wedding, the more manageable the costs will be. Start by mapping out a saving timeline to ensure you stay on track. For instance, if your wedding is in a years time and your estimated costs totals $32,000 and you only have $16,000 in savings and parental gifts, you will need to save approximately $3,350 a month until your wedding date. After that, decide where you will stash your savings. Money sitting in an everyday account can easily get spent up. 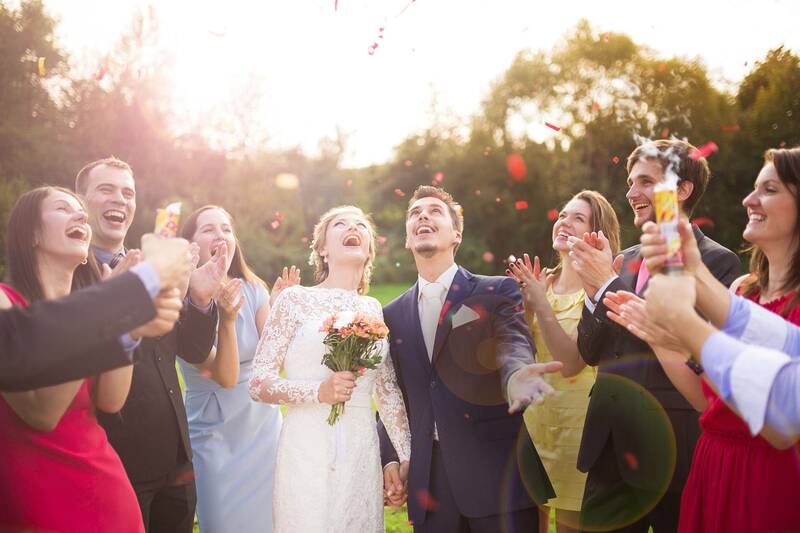 Opening a saving account for your wedding ensures that the money only goes in and not taken out, at least until you are ready to pay for the wedding. It also helps you stay motivated and makes it easier to track your savings and expenses. If you and your partner already live together, one of the fastest and easiest ways to save for your wedding is to bank one paycheck so that you live on one to reach your goal. If on the other hand, you are not living together, one partner can consider moving back with their family to save as much from their paycheck before the wedding. Although it is not the ideal situation, it is far much better than paying for your wedding with a loan and spending the first few years of your marriage paying back debts. Seek out additional sources of income. If your salary cannot sufficiently finance your wedding, you can try selling unwanted electronics, furniture, and electronics to bring in some extra cash. You can also take on a side job to generate more income. You may also consider each one of you getting an extra part-time job as opposed to putting the burden entirely on one person. This will help reduce the number of extra hours you need to work in order to reach your wedding saving goal. If you are planning a high-end wedding and you are pretty sure you are not able to save enough between now and then, you still have the option to cut down the size and cost of your wedding. Although it might not be the preferred choice, it is one of the wisest decisions you will ever make as it will keep you out of debt. This is especially important if you are each bringing student loans, credit card or car loans into the marriage. We all want the wedding of our dream. However, it is not worth it if it means starting marital bliss in debt. So take the time to save up as much as you can as opposed to taking a loan to finance your wedding.